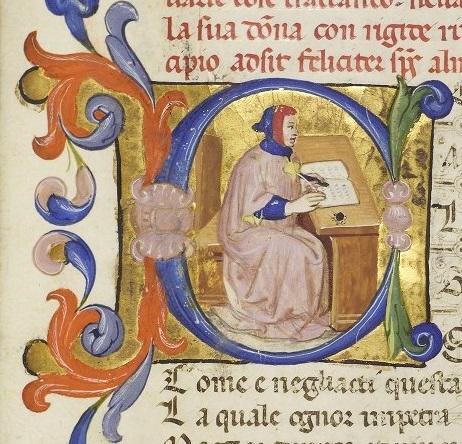 John Rylands Library, Italian MS 1. Copyright of the University of Manchester. Used with permission. Following the annual membership meeting of the Dante Society of America, a day-long symposium will feature one keynote lecture, two panels, and a response that address the idea of pedagogy in the Commedia conceived broadly. Our presenters will address the following topics: what questions we ask of Dante, what questions are asked of us as teachers of Dante, and how Dante himself teaches us to appreciate, read, and teach his poem. All sessions will be held in John J. Burns Library at Boston College. See below for information on directions, parking, and nearby hotels. Registration is not required and there is no fee for attending. The symposium, including the buffet lunch and reception, is free and open to the public. Please feel free to share a link to this page or this program flyer with others. We also encourage you to download and post the conference poster to your social media account (JPEG version) or print it for local circulation (PDF sized for 11"x17" paper); you may also request printed copies to be sent by regular mail by writing to dantesociety@gmail.com. Program sessions will be videorecorded and made available for viewing via this website following the symposium. This event is sponsored by the Dante Society of America with support from The Nicholas J. Sottile Fund for Italian Studies of the Department of Romance Languages and Literatures at Boston College and The Heinz Bluhm Memorial Lecture Series Fund, and additional support from the Boston College Libraries. Please refer to the Boston College website for information on getting to campus by car or public transportation and parking. For parking, we recommend the Commonwealth Avenue Garage (Google Maps location) for its proximity to Burns Library. For precise walking or rideshare directions to Burns Library, enter “John J. Burns Library” in a mapping service (note: this is more effective than entering simply “Boston College”or the main campus address, 140 Commonwealth Avenue, Chestnut Hill, MA). We invite you to download a printable map of the immediate vicinty of the library and parking garage that also includes information on handicap parking an accessible entrance. Those needing special assistance, should contact local accommodations organizer and Dante Society secretary Christian Dupont in advance at dantesociety@gmail.com. Boston College is located in Chestnut Hill, Massachusetts, approximately 6 miles west of downtown Boston. There are many accommodation options in the area at a variety of rates. The Boston College undergraduate admissions office maintains a list of hotels near campus sorted by distance and accessibility to public transportation (the MBTA or “T”; see trip planner). Hotel Boston is offering discounted rates for conference attendees (single king $159; two doubles $174; two queens $189 + 14.45% tax and $20/night parking); mention "Dante Society" when calling to making your reservation or use the promo code "Dante518" when making reservations online. Additional lodging options may be found via websites like BedandBreakfast.com and Airbnb.com.